The Ranger's lone engine option will come equipped with a 10-speed transmission. The revived Ford Ranger's turbocharged four-cylinder engine will be able to tow and haul more than the V-6 gasoline offerings from its rivals in the midsize pickup segment when it hits dealerships next year. 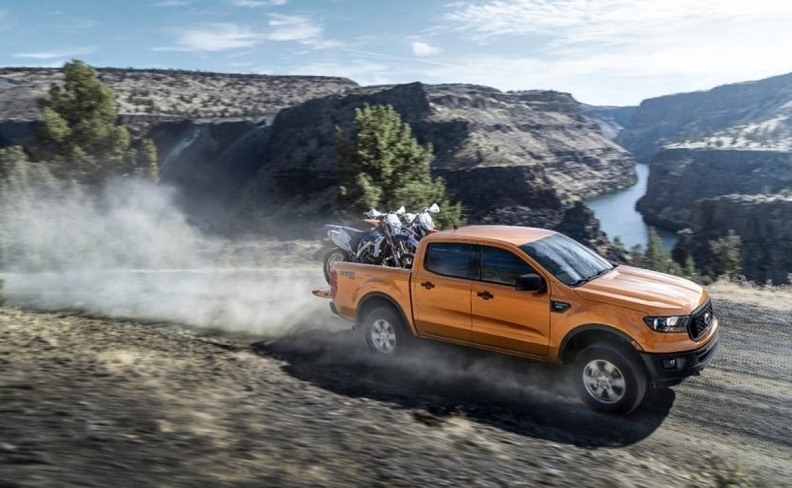 The 2019 Ranger's 2.3-litre EcoBoost can haul up to 843 kilograms (1,860 pounds), tow up to 3,401 kilograms (7,500 pounds) and generate 270 hp and 310 pound-feet of torque. The closest competitor, the Chevrolet Colorado, has a towing capacity of 3,175 kilograms (7,000 pounds) and a maximum payload of 803 kilograms (1,772 pounds) with its 3.6-litre V-6. The GMC Canyon can also tow up to 3,175 kilograms (7,000 pounds) and haul up to 795 kilograms (1,753 pounds). However, both pickups can tow up to3,492 kilograms (7,700 pounds) with an available 2.8-litre four-cylinder diesel engine. The segment-leading Toyota Tacoma can tow up to 3,084 kilograms (6,800 pounds) and can haul up to 734 kilograms (1,620 pounds) with its 3.5-litre V-6. Tacoma’s Canadian sales through September are 10,703 units, up 13 per cent. "Think of Ranger as the biggest and most capable backpack for your gear," Rick Bolt, Ford Ranger chief engineer, said in a statement on Friday. The Ranger was discontinued in Canada and the United States in 2011 but has continued to sell in a number of overseas markets. The latest North American version, to be built at Ford's Michigan Assembly Plant, has a mostly steel body, axles made by Dana Inc. -- which supplies the Jeep Wrangler -- and an exterior design similar to its larger F-series counterparts. The pickup will come in three trim levels: XL, XLT and Lariat. Ford will sell two-door SuperCab and four-door SuperCrew configurations and offer both four-wheel drive and two-wheel drive for each configuration. An off-road FX4 package will be offered on all 4wd models. The Ranger will start at US$25,395 in the United States, including shipping. That's roughly the same as the Toyota Tacoma, but more than the Chevrolet Colorado and GMC Canyon. Canadian pricing has not yet been announced. Fuel economy numbers have not yet been finalized.